Our Apache Police Western Badge was reproduced from existing originals in museums and private collections, the badges of the Old West are crafted in silver plated solid brass with sturdily mounted pin fasteners. Our Arizona Rangers Western Badge was reproduced from existing originals in museums and private collections, the badges of the Old West are crafted in silver plated solid brass with sturdily mounted pin fasteners. The Deadwood Marshal Badge was reproduced in silver - plated solid brass with sturdily - mounted pin fasteners. Great for the Western reenactor, collector of Western memorabilia or decorator. Our Cochise County Sheriff Western Badge has been reproduced from existing originals. Great for the Western reenactor, collector of Western memorabilia or decorator. Our City Marshall Western Badge was reproduced from existing originals in museums and the badges of the Old West are crafted in silver plated solid brass with sturdily mounted pin fasteners. Great for the Western reenactors. Reproduced from existing originals in museums and private collections, our badges of the Old West are crafted in silver-plate and solid brass with sturdily-mounted pin fasteners. Our Sheriff Badge Replica brings memories of the time when Wilson stated this, in 1790-1, the powers and duties of a sheriff were in general, coincident with those of the time. Our Lincoln County Sheriff's Badge hearkens back to the days of the Old West when Billy the Kid was taken down. The Deputy US Marshal Badge, reproduced from existing originals in private collections and crafted in silver - plated solid brass with sturdily - mounted pin fasteners. Great for the Western reenactor, collector of Western memorabilia. The Deputy Sheriff Badge was reproduced from originals in museums and crafted in silver - plated solid brass with sturdily - mounted pin fasteners. Great for the Western reenactor, collector of Western memorabilia or decorator. The Pony Express Messenger Badge one of our badges of the Old West are crafted in silver - plated solid brass with sturdily - mounted pin fasteners. Great for the Western reenactor, collector of Western memorabilia or decorator. 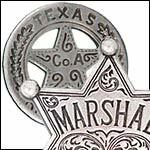 Our Marshall Dodge City badge was reproduced from existing originals in museums and are great for the Western reenactor, collector of Western memorabilia or decorator. Our Sheriff Badge is great for the Western reenactor, collector of Western memorabilia or decorator. Our badges of the Old West collection replicates surviving examples in detail and features cast metal construction with solid mounted spring pins. Great for the Western re-enactor, collector of Western memorabilia or decor. The offices of U.S. Marshals and Deputy Marshals were created by the first Congress in the Judiciary Act of 1789, the same legislation that established the federal judicial system. Our US Marshall Tombstone Badge was reproduced from existing originals in museums and private collections, the badges of the Old West are crafted in silver - plated solid brass with sturdily - mounted pin fasteners. Sheriff Lincoln County Badge reproduced from existing originals in museums and private collections. The old west badges are crafted in silver - plated solid brass. Great for Western re-enactor or collector of Western memorabilia. Our Texas Rangers Badge was reproduced from existing originals in museums and private collections, the badges of the Old West are crafted in silver - plated solid brass with sturdily - mounted pin fasteners. Our US Marshall Star was reproduced from existing originals in museums and private collections, the badges of the Old West are crafted in silver plated solid brass with sturdily mounted pin fasteners. Our US Marshall Western Badge reproduced from originals in museums and private collections are crafted in silver plated solid brass with sturdily mounted pin fasteners. Great for the Western reenactor or collector. Our Special Ranger Western Badge Cattle was reproduced from existing originals. The badges of the Old West are crafted in silver plated solid brass with sturdily mounted pin fasteners. Great for the Western reenactor. The Tombstone Sheriff Western Badge was reproduced from existing originals in museums and the Old West badges are crafted in silver plated solid brass with sturdily mounted pin fasteners. Great for the Western reenactor. Our Special Police Western Badge Railroad, the badges of the Old West are crafted in silver plated solid brass with sturdily mounted pin fasteners. Great for the Western reenactor, collector of Western memorabilia or decorator.